In 1959, Joe Christopher became the first player born in the US Virgin Islands to make the majors -- but that was just a technicality. Valmy Thomas, also from St. Croix, made his big-league debut in 1957. Thomas was born on Puerto Rican soil, but only because his mother sought a better hospital -- newborn Valmy was immediately brought home. In the decades since, 12 more Virgin Islanders (as of 2016) have made it to the majors. Yet none has had a better single season with the bat than Christopher did in his finest year, 1964, when he hit .300 with 16 homers and 78 RBIs for the New York Mets. US fans mainly remember Christopher today as one of the original Amazin’ Mets, but the outfielder, whose pictures most often show him grinning calmly, started his big-league career as a backup for the Pittsburgh Pirates. Fleet afoot, "Hurryin’ Joe" (as announcer Bob Prince dubbed him) was often used as a pinch-runner. In the 1960 World Series, he appeared in three games and scored twice. In addition to his small role with the 1960 world champs, Christopher won several more titles in his second home, Puerto Rico, plus two more as a playoff reinforcement in the Dominican Republic and Venezuela. Joseph O’Neal Christopher was born in Frederiksted, St. Croix, on December 13, 1935. His father, Patrick Christopher, was an overseer on a mango and cane plantation in Estate Oxford, part of the “rainforest” section in the northwest corner of St. Croix. His mother, Sarah Richards Christopher, had five other children. There were two brothers, Patrick and Alfred, and two sisters, Elizabeth and Agnes. (Another brother, Augustus, died in infancy.) Joe was the baby of the family, born to Sarah in her 40s. Baseball was once the most popular sport in the Virgin Islands. Four other major leaguers of the 1960s and ’70s also grew up around Frederiksted, which had a population of 2,000 when Christopher was young. Pitcher Julio Navarro, who was born on the nearby Puerto Rican island of Vieques but moved to St. Croix at the age of seven, was about a couple of years older than Joe. Elmo Plaskett, who used to wake Joe up to play sandlot ball when both were young boys, was born in 1938. Horace Clarke and José Morales came along in 1940 and 1944, respectively. Christopher played high-school ball at St. Patrick’s, a parochial school in Frederiksted. An Irish Catholic priest named Mullin was a driving force behind the program. Joe also became the shortstop for a local team called the Annaly Athletics. This club was sponsored by Frits Lawaetz, a member of one of the old Danish families on St. Croix, which along with St. Thomas and St. John was owned by Denmark until 1917. On Sunday mornings the young ballplayers of Frederiksted would go out and do their own groundskeeping, using a handmade roller that weighed at least 200 pounds. They played in the afternoons after resting from their labor and sat around talking baseball past midnight. The Christiansted Commandos, with Joe at shortstop, journeyed 3,129 miles to Wichita. The squad also featured Joe’s brother Alfred at catcher, Julio Navarro, and 16-year-old Elmo Plaskett. The Commandos lost two games after getting a bye, but Joe Christopher caught the eye of Pirates superscout Howie Haak. After he signed Joe, the Virgin Islands became part of Haak’s itinerary. He later signed Plaskett and Al McBean for the Bucs. As Christopher remembered, though, it wasn’t that easy for Haak. “He was offering $150 a month plus a $200 bonus, and I told him I could work in the post office for $600 a month.” But Joe did join the Pirates, where he encountered general manager Branch Rickey, “an old man in a Panama hat giving lectures. Everybody was falling asleep -- except Joe Christopher.” According to Joe, Branch took a liking to the neophyte and passed on thoughts about scouting systems and the process that led to the signing of Jackie Robinson. After later injuring his ankle as he hit first base, Christopher returned to Columbus. Manager Cal Ermer greeted him, “Joe, I hate to see you . . . but I’m glad to see you!” That is, Ermer wished that Christopher could have stayed with the big club, but even so, he was happy to use him on his squad. Christopher, like fellow Virgin Islanders McBean, Plaskett, and Clarke, met his wife while playing in Puerto Rico. He and Ana Solares were married on December 20, 1959. He then returned to the team with which he would earn his World Series title. With the 1960 champs, Joe was a role player (61 plate appearances, .232 in 50 games). He came north with the Pirates in April but was barely used over the first several weeks of the season. He was sent down to Salt Lake City to see regular action, but the Pirates recalled him in early June, and he stayed on their roster the rest of the year. On August 7 Joe hit his first big-league homer, a three-run smash off San Francisco’s Billy O’Dell at Forbes Field. 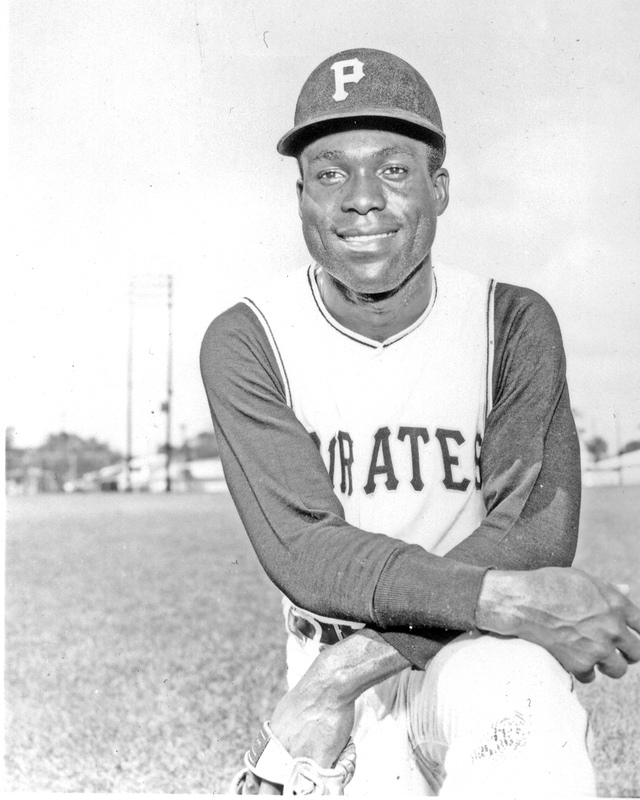 Joe also recalled how he, Roberto, Román Mejías, and Gene Baker -- two other Pirates of African descent – hung together during spring training in the segregated Florida of those days. The men endured having to wait on the bus as sandwiches were brought out to them, since they could not join their teammates inside restaurants. They roomed in a private home in Fort Myers, Florida, home of the Bucs’ camp. Christopher said that as they watched old movies on TV, Clemente formed the idea of what he would eventually do for the youth of Puerto Rico from the Spencer Tracy film Boys Town. Joe L. Brown, who succeeded Branch Rickey as the Pirates’ general manager in 1955, recalled that Christopher “could run like the dickens, was a good outfielder, and a decent hitter.” But the Pirates did not regard him as a regular, giving him just 186 at-bats in 76 games in 1961. So Joe got his chance to start in the majors with Casey Stengel’s comical crew. He was the Mets’ fifth pick in the expansion draft, costing them $75,000. Still, it took two more seasons before Christopher emerged as a regular. In 1962 he spent April and most of May at Triple-A Syracuse. The prevalent memory of Joe that year is the oft-told “Yo La Tengo” story: The bilingual Caribbean taught center fielder Richie Ashburn how to say “I got it” in Spanish for the benefit of shortstop Elio Chacón – but Richie was then flattened by left fielder Frank Thomas. Joe started 69 times in 119 games, playing behind Thomas, Ashburn, and Jim Hickman. He was part of a championship team with the Mayagüez Indios in 1962-63, and won the third of his four stolen-base titles in the Puerto Rican Winter League. But again in 1963, he did not make the Mets out of spring training. He played most of the season at Triple-A Buffalo, and once he was recalled in July, he put up quiet numbers. Christopher did not sustain his hitting form in ’65. An injured finger set him back in spring training, and the organization was high on rookie Ron Swoboda. Joe was traded to Boston for Eddie Bressoud after that season, and he played briefly in ’66 for the Red Sox, going 1-for-13 in 12 games. He was dealt with pitcher Earl Wilson to Detroit, but his big-league career had come to an end – he never played for the Tigers. His final totals in the majors were 29 homers, 173 RBIs, and a .260 average in 638 games across eight seasons. He stole 29 bases and was caught stealing 19 times. Right field was his main position; he appeared 278 times there and 154 times in left. His 52 games in center field may have been what colored Christopher’s reputation as an unsteady fielder. In 1966 he played for the Syracuse Chiefs, Detroit’s affiliate. Joe’s marriage to Ana ended in divorce that year, not long after he was sold by Syracuse to the Richmond Braves (for whom it does not appear he played). Their three daughters continued to live in Puerto Rico. Christopher stayed active in the minors through 1968. He returned to the Pirates organization the next year, but after playing briefly with Columbus, he joined the Tulsa Oilers, a Cardinals farm club. St. Louis wanted to send him down to Double-A after the 1967 season, so Christopher asked for his release. Then at the urging of a friend, AP writer Joe Reichler, he wrote to all the major-league clubs, hoping to benefit from forthcoming expansion. Paul “The Pope” Owens of the Phillies extended an offer, albeit also at Double-A Reading. Joe also continued to play in Puerto Rico through the 1968-69 season. He held out in the 1964-65 season and also sat out 1966-67, but was part of two more champion teams in 1967-68 and 1968-69. Christopher finished his Puerto Rican Winter League career with 37 home runs, 240 RBIs, a .264 average, and 125 stolen bases in 13 seasons. But he still wasn’t quite through as a player. In the spring of 1972, at the age of 36, he made a ten-game comeback in Mexico. After leaving the field, Joe continued to live in New York for some years. Among other things, he worked for an ad agency named Promotions Colorful, holding a vice presidency. In the early ’90s, he was married once again. Joe and Karen Matthews Christopher had a daughter named Kameahle. As of 2011, they lived in the Baltimore area. A big part of Joe always wanted to be a coach. He used to hold forth like a martial arts sensei, talking about hitting to anyone who will listen. He discussed hitting with the innermost elite – Ted Williams, Rogers Hornsby (a ’62 Mets coach), and George Sisler (a special instructor with the Pirates – who first met Joe while serving as US high commissioner at the NBC tournament in 1954). This biography originally appeared on the website "Baseball in the Virgin Islands," from which it has been adapted. It is also included in the book "Sweet '60: The 1960 Pittsburgh Pirates" (SABR, 2013), edited by Clifton Blue Parker and Bill Nowlin. For more information or to purchase the book in e-book or paperback form, click here. Grateful acknowledgment to Joe Christopher for additional personal memories over the years (most recently by telephone on July 3 and October 19, 2007). Private database of José A. Crescioni, the late SABR member who compiled statistics for the Puerto Rican Winter League. 1 Larry Moffi and Jonathan Kronstadt. Crossing the Line: Black Major Leaguers 1947-1959 (Iowa City, Iowa: University of Iowa Press, 1994), 203. 2 Brian C. Engelhardt, “Former R-Phil’s career was work of art,” www.readingphillies.com, April 21, 2006. 3 Mike Shannon, Tales From the Ballpark (Lincolnwood, Illinois: Contemporary Books, 1999), 54. Story told by bullpen catcher Bob Enochs. 4 Bruce Markusen, Roberto Clemente: The Great One (Champaign, Illinois: Sports Publishing Inc.), 105. 5 Ibid., pp. 67-68, 196. 6 Paul Zimmerman, “Mets’ Biggest Hit of ’64 Season Is Christopher,” New York World-Telegram, August 19, 1964.